MELBOURNE, Australia (AP) — Jhonattan Vegas woke up Thursday expecting the worst of Melbourne’s weather after officials moved up the tee times by an hour to try to beat expected rain in the afternoon. He was pleasantly surprised to see the sun shining. He and his Venezuelan partner Joseph Naffah shot 7-under 65 and were three strokes behind leading South Korea, England and Australia at the World Cup. Like a big fish story, Shane Lowry’s birdie putt for Ireland at the World Cup kept getting longer, thanks to his partner. Lowry and Paul Dunne shot an 8-under 64 and were tied for seventh with India and two strokes behind leaders England, South Korea and Australia at Metropolitan. As New Zealand’s top-ranked golfer at the World Cup, Ryan Fox had the choice to pick his partner, and he took 43-year-old veterarn Mark Brown when several other players were not available. Brown responded with a strong round Thursday to lead New Zealand to a 7-under 65 and tied for ninth. 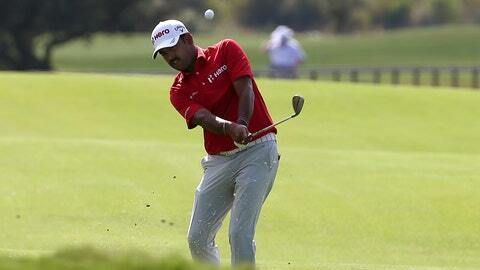 Danny Lee withdrew from the event for New Zealand to spend time with his family. Michael Hendry was unable to commit with his Japan tour card in jeopardy. Thomas Pieters and Thomas Detry birdied six of their last seven holes for a 9-under 63, a stroke behind the leaders, but it didn’t always look like it was going to end that way. They made five pars to open, then on the par-3 sixth, their tee shots were about 100 feet apart. “We weren’t that far away from thinking, ‘OK, maybe it’s now time to go back and close the season off right now,'” Detry said. But the Belgian pair saved par on that hole, then made three birdies to finish off the front nine, followed by their six of nine on the back. Anirban Lahiri and Gaganjeet Bhullar were tied for seventh with Ireland after making five birdies in six holes on the front nine and another birdie on 18, giving them what Lahiri called an “aggressive” 64. On Friday, it will be alternate shot, or foursomes.